Panasonic TX-58DX802 review | What Hi-Fi? If you have ever been shopping for a big TV, you may have noticed that there tends to be less choice at this end of the market. Quite often the decision comes down to either a 55in or 65in screen, which is rather like picking between size nine or ten shoes when the half size would be a better fit. But thankfully, Panasonic has come up with a solution – the previously little-known 58in screen. This one is part of its Viera DX802 range, which sits underneath the flagship DX902 models and, despite the relatively modest size and price, ticks both the 4K and HDR boxes. The 40W soundbar is not only capable of a sound louder and more powerful than we’ve come to expect from standard built-in TV speakers, but clearer and more solid too. Rarely do we hear the Countdown theme sounding so dramatic through a TV. Of course, you’ll reap the benefits when watching something slightly more thespian. With Furious 7, revving cars have weight and explosions impact, while Vin Diesel’s voice also gives the woofers a workout. Although a midrange soundbar like the Q Acoustics Media 4 will more effectively bring soundtracks to life with greater dynamics and detail, there’s no denying that a soundbar is a valuable inclusion to the all-in-one set-up here. Panasonic’s new ‘Cinema Display’ panel in the TX-58DX802 isn’t UHD Premium-certified like the flagship DX902 models, but whether it can officially reach 1000-nits brightness and produce 90 per cent of the DCI P3 colour standard or not, we like what we see as we stream Red Oaks from Amazon in 4K and HDR. The picture goes brighter than you’d ever need it, even in the lightest of rooms, and colours punch like they’re being egged on. It’s worth knocking both down to modest levels, though, so grass looks lush and not like newly laid Astroturf, and country club signs don’t look overly regal. MORE: HDR TV - What is it? And how can you get it? Motion is well handled as golf buggies dart across parks, and detail is, largely, liberally spread from corner to corner. We say largely because it struggles to match rivals for dark detail. In darker scenes, Craig Roberts’ black hair has an unrealistic sheen and, with the Panasonic overlooking individual strands, it tends to resemble the plastic uniformity of a Lego man’s barnet. The Samsung UE55KS9000 is shrewder in this respect, striking a better balance between black depth and insight into darks, and simultaneously managing greater subtlety in shading elsewhere too. Still, the potency of black levels is pleasing, and at the other end of the contrast band tennis whites, clean and sparkling, look fit for a washing powder TV advert. The sharpness, and with it cleanliness, 4K resolution offers is even more apparent with Ultra HD Blu-rays as we switch to The Martian. Contrast steps up a gear, the Pana’s pencil goes a few more turns through the sharpener, and counting how many shades make up one frame of Mars’ landscape requires two hands. Even Blu-ray – even one as lame as Furious 7 – looks fetching. Sure, there is a significant but not entirely unexpected drop in quality when you come back down to pre-2015 TV quality: 1080p resolution and standard dynamic range. But the TX-58DX802’s upscaler puts in a killer shift to ensure the picture remains enjoyable and just as coherent. We should say though that the Samsung UE55KS9000 not only puts in a shift, but also works overtime for a tad more crispness and stability. When the TV tuner is called upon for the evening soaps, knocking down colour saturation a wee bit more is worth the effort. 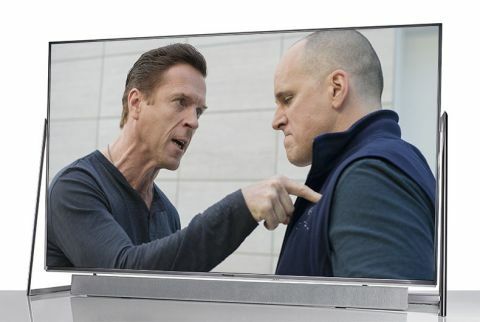 High- and standard-definition broadcasts are both perfectly watchable although, as on all big-screen 4K tellies we’ve seen, the latter is nevertheless tainted with noise and softness. The lesson to be learned here is that, where possible, you should stick to high-definition content – of which there is plenty embedded into the TX-58DX802’s smart offering. At the centre of these offerings are the full suite of UK catch-up TV apps, including Netflix and Amazon Instant. The latter appears twice in fact (not that you need it to): individually on the home page and also buried within Freeview Play, which like YouView huddles the streaming services and a comprehensive roll-back EPG under one umbrella. Our love for Panasonic’s Firefox-powered OS is no secret, and its simple navigation and customisation wins us over once again as we painlessly and swiftly flit between picture settings and smart apps. What’s more, Panasonic says updates later this year will bring greater TV-optimised content and easier sharing between portable devices and the TV. MORE: Freeview Play - What is it? And how can you get it? By being one of the easiest and most fully-featured TVs to operate, and by setting itself apart from the competition with above-par sound and interesting (albeit not the most practical) design, the Panasonic TX-58DX802 is no doubt an attractive jack-of-all-trades option for those that can house it – even if straight-up picture purists may be better off shopping elsewhere.